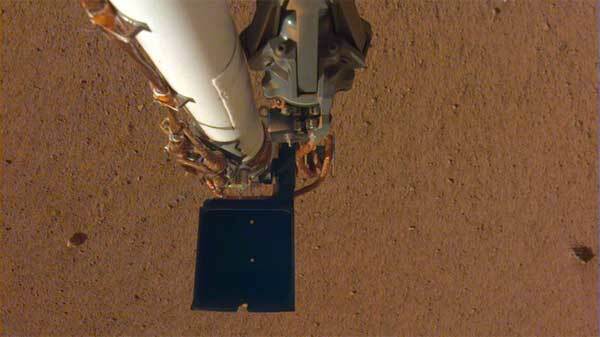 PASADENA, Calif. (NASA PR) — New images from NASA’s Mars InSight lander show its robotic arm is ready to do some lifting. With a reach of nearly 6 feet (2 meters), the arm will be used to pick up science instruments from the lander’s deck, gently setting them on the Martian surface at Elysium Planitia, the lava plain where InSight touched down on Nov. 26. But first, the arm will use its Instrument Deployment Camera, located on its elbow, to take photos of the terrain in front of the lander. These images will help mission team members determine where to set InSight’s seismometer and heat flow probe — the only instruments ever to be robotically placed on the surface of another planet. Over the past week and a half, mission engineers have been testing those instruments and spacecraft systems, ensuring they’re in working order. A couple instruments are even recording data: a drop in air pressure, possibly caused by a passing dust devil, was detected by the pressure sensor. This, along with a magnetometer and a set of wind and temperature sensors, are part of a package called the Auxiliary Payload Sensor Subsystem, which will collect meteorological data. 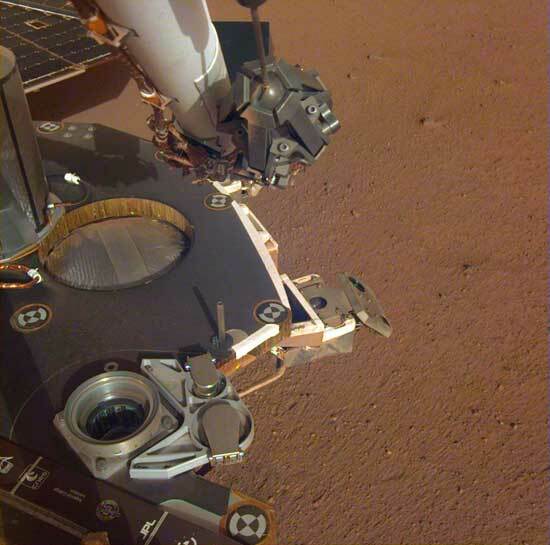 More images from InSight’s arm were scheduled to come down this past weekend. However, imaging was momentarily interrupted, resuming the following day. 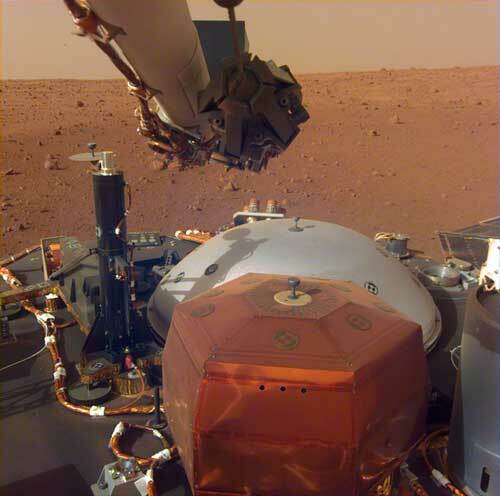 During the first few weeks in its new home, InSight has been instructed to be extra careful, so anything unexpected will trigger what’s called a fault. Considered routine, it causes the spacecraft to stop what it is doing and ask for help from operators on the ground. Spacecraft engineers had already factored extra time into their estimates for instrument deployment to account for likely delays caused by faults. The mission’s primary mission is scheduled for two Earth years, or one Mars year — plenty of time to gather data from the Red Planet’s surface. I look forward to the HP3. If Mars shows a decent temp in the ground, then it will make it possible to do geo-thermal electricity (small amounts, but ideal for running probes), as well as geo-thermal HVAC. Of course, if we have a few nuclear power plants, that would be good. Agreed, windbourne, the more power options, the better. Regards, Paul. Sorry no, the thermal gradient will be just millidegrees, enough for scientists to extrapolate some global physics, but not enough ∆T for useful work. The TES on Global Surveyor did not see any significant geo-thermal spots on Mars. Never the less, I have running bets in play, that the Insight SEIS will either “hear” magma movement below Tharsis, or (if we get lucky) an impact in the right spot will allow the inference of something um “gooey” under Tharsis. There are some very young lava flows on the plateau, the odds that the complex would just happen to shut down in the same epoc as the naked monkeys on the third rock developed spaceflight…are just too remote. Ah. U are thinking crust only. If say 50 m down the temp is constant 0C, then it is a simple matter of using atmosphere night temp. Yes, it will not be a 24×7 operation , but it would by 7 .